A new Polish law criminalizes blaming Poles for any wrongdoing against other nations. But the move only serves to highlight the fact that some Poles were complicit in crimes against Jews, while jeopardizing the country's relationship with its three most important allies: the US, Germany, and Ukraine. Featured photo by DzidekLasek, Pixabay. Warsaw – The Polish government has provoked yet another international crisis, this time by adopting a law that is ostensibly meant to combat the phrase “Polish death camps.” The law targets a geographical shorthand, sometimes used abroad, for the extermination camps that the Nazis established on Polish territory during World War II. But there is more to the move than that. When Poles talk about the Warsaw Ghetto, no one sees this as a problem. Similarly, virtually no one who uses the phrase “Polish death camps” – including former US President Barack Obama and former FBI Director James Comey – does so out of ill will toward Poland. Such phrases can be found even in Polish schoolbooks, such as Zofia Nałkowska’s excellent book on the Holocaust, Medaliony. Nevertheless, many Poles believe that people abroad are misled by this phrase. When Poles talk about the Warsaw Ghetto, no one sees this as a problem. This is not the first time Polish politicians have spoken out against “Polish death camps,” and the issue’s appeal is not limited to the ruling Law and Justice (PiS) party. Indeed, the issue was first taken up by former Polish foreign minister Radek Sikorski. But the new law does not mention death camps. It criminalizes blaming Poles for any wrongdoing against other nations. While the law includes exemptions for scholarly publications and artistic works, it applies to journalistic writing, posing a threat to open public debate. The Israeli embassy in Waraw responded with a sobering question: Will Holocaust survivors giving testimony about their personal histories also be subject to criminal liability? And back in Jerusalem, the Knesset has threatened to adopt legislation that would classify diminishing the role of Poles who participated in the Holocaust as a crime. A draft bill has the support of 61 of the Israeli parliament’s 120 members. Poland now faces the threat of isolation by the West and loss of international influence. Indeed, Poland is risking its relationship with its three most important allies – the US, Germany, and Ukraine – which up until now have tolerated the antics of Jarosław Kaczyński, Poland’s de facto leader. Poland now faces the threat of isolation by the West and loss of international influence, leaving the country vulnerable to Vladimir Putin’s revanchist Russia. Despite much of the Polish elite’s evident horror at the law, Kaczyński will not back away from it. To be clear, Kaczyński, like his deceased twin brother, Lech, is not an anti-Semite. As president, Lech Kaczynski was an enemy of anti-Semitism in Poland and celebrated Hanukkah in a synagogue. In fact, until now, Poland’s government was probably the most pro-Israel in Europe, reflected in its abstention from a recent United Nations General Assembly vote to condemn US President Donald Trump’s recognition of Jerusalem as Israel’s capital. But Jarosław Kaczyński, whose populism was once held in check by his brother, shaped this new legislation in ways that are politically favorable to PiS, which he leads, by effectively taking centrist voters hostage. The legislation does not offend such voters because the idea of banning the phrase “Polish death camps” seems benign. 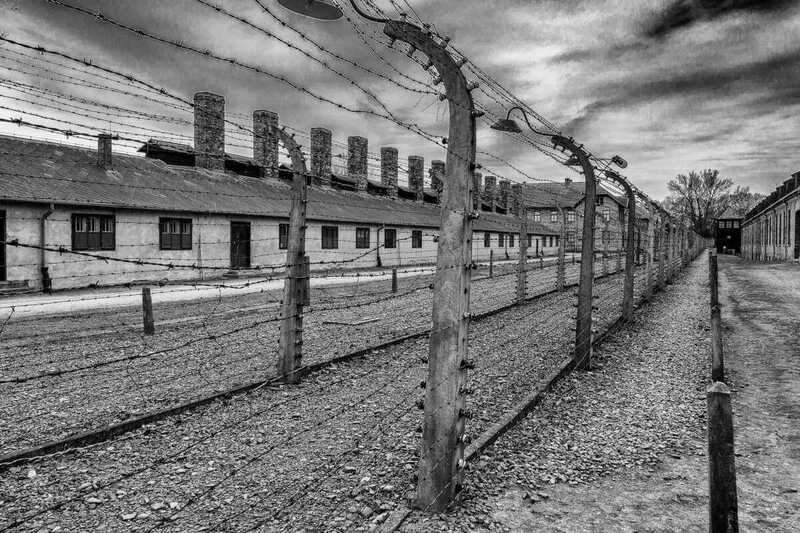 Electric Fence in Auschwitz. Photo by Jechstra, Flickr. At the same time, having expelled the most radical right-wing politicians from the government (Foreign Affairs Minister Witold Waszczykowski, Defense Minister Antoni Macierewicz, and Minister of the Environment Jan Szyszko), Kaczyński needs to regain the trust of far-right PiS voters. They will be pleased that Poland is standing up to Israel, Ukraine, and, indeed, the entire world. The PiS’s cynical approach is revealed by the fact that even its leading members acknowledge Poles’ role in the persecution of Jews. About a month ago, Ryszard Czarnecki, a PiS member and vice president of the European Parliament, compared an MEP from the opposition Civic Platform (PO) to a szmalcownik, a pejorative term for those who blackmailed Jews who were hiding from the Nazis or those who protected them. Kaczyński needs to regain the trust of far-right PiS voters. Never mind that the heads of four European Parliament groupings responded by calling for Czarnecki’s removal from his post, or that Poland’s prime minister, Mateusz Morawiecki, defended Czarnecki. In condemning szmalcowniks, was Czarnecki not admitting that in addition to Poles who saved Jewish lives, there were Poles who sent them to their deaths, as Polish historians like Jan Gross, Irena Grudzińska, Barbara Engelking, Jan Grabowski, Jacek Leociak, Dariusz Stola, and others have thoroughly documented? The ugly fact is that the new law was promulgated on the 73rd anniversary of the liberation of Auschwitz, and just before the 50th anniversary of the Polish communist government’s anti-Semitic campaign of 1968, which resulted in an exodus of 20,000 Poles, depriving the country of some of its brightest minds. So far, there is one jarring similarity between these two events: both gave Poland a black eye while stoking nationalist fervor among the “patriotic electorate.” One hopes that this is where the similarities end.